Do you need a Christmas card idea? And when it does, oh dear! Oh dear!" A Christmas card idea can be very welcome when you haven't started making your cards yet. Did you know some people start making their cards immediately after the New Year or even sooner? I am not quite as good as that. I may start in July or August though :) When do you start making your own cards for the end of the year? I find that being organised and having even some items finished before the end of the year takes away some of the pressure of having too many things to do at once. If you wanted to be even more orgainised, you could even address your envelopes and have stamps on them, all ready to be posted away at the right time. I recommend that you just leave the envelopes unsealed in case you want to pop in some last minute news before you do mail them off. For this issue of Paper Twists I am going to show you some of my completed cards and also offer you a sketch that may be simple enough to allow you to make a number of cards at once. I think the process of finding a design is half the battle in making cards. Maybe a sketch will help shorten the thinking time! The beauty of having a sketch to work from is that you can change the colours, papers, embellishments and stamps and make it look different every time, or you can use it as a jumping point to help you make a stack of the same type of greeting all at once. A sketch is a tool to guide you, not a rule to dominate or control you. Use it in a way that suits your own purpose. It's a Christmas card idea that can be used in many different ways. 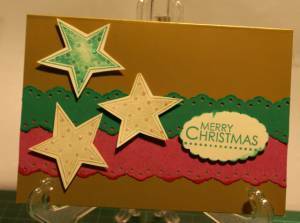 This first card is one I made with some border scallop punches, a stamped Christmas tree and a scalloped sentiment. The glitter is all Kindy glitz. When using Kindy glitz, make sure to allow plenty of drying time. I left my cards to dry overnight and the result was good. No glitter rubbed off the next day!Of course, Stampin' Up! has glitter glue too and it works beautifully. The advantage of the glitter glue is that while it goes on three dimensionally, it dries almost perfectly flat. That's great for when you want to mail cards from a Post Office as they don't seem to get as battered by the mailing process. To save time, one of my secrets is to make quite a few of the elements you want to use all at once. I stamped and coloured lots of trees and cut them out before I started making cards, for example. I could do that in front of the TV with my hubby in the evenings. 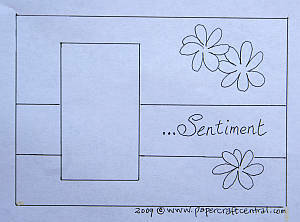 You could make the borders too, and stamp and scallop the sentiments. Then make 'kits' by placing all the elements for one card in piles or bags, and when you have time to assemble them, you can quickly make quite a few at once. I used some stars on the next card and switched the sketch around. Again, just stamp lots of stars and cut them out as you watch TV or are waiting for an appointment. Add the Kindy Glitz or glitter glue when you have time to allow them to dry, then you are ready to add Stampin' Dimensionals and assemble your cards. I think altogether I have made about 20 cards so far. Only another 80 or so to go if I always want to give everyone on my list a handmade greeting! The number of greetings you make does depend on personal preference. 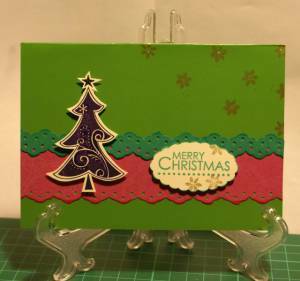 Do you have people on your list who may not appreciate the time and effort that goes in to making a handmade greeting card? If so, save your time and trouble just for the ones who do appreciate them, and you will reduce the time you need to get ready again.